A once-in-a-decade summer swell with 10-12 foot pounding sets, five straight days of overhead surf, the Swami’s Great White Shark Debate, shark sightings at other San Diego-area beaches, and a second major upwelling of the summer that caused water temps to plummet almost 15 degrees overnight to the mid-50s. What a memorable Labor Day Weekend it was. Now that it’s over, Encinitas lifeguards can finally take a breather. They deserve it. 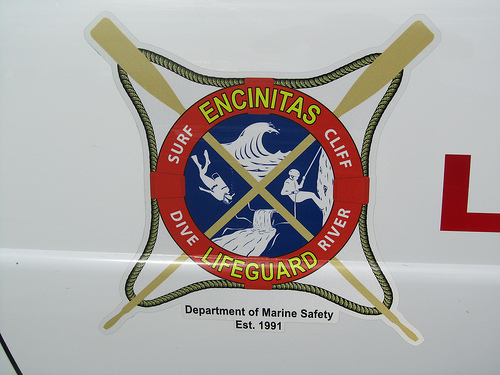 The holiday weekend full-time staff of 15 guards responded to 78 incidents in the water, according to Encinitas Lifeguard Captain Larry Giles. An additional 22 rescues were made, 10 of which involved surfers. Onshore, there were 53 medical aid responses. Among some of the holiday weekend’s most dramatic rescues included the longest distance rescue of the year. A 12-year old boy was swept away by a rip current over one-quarter mile out to sea. “He ended up well past where the kelp beds begin,” Giles said. The boy was rescued after a lifeguard stationed at Stone Steps responded to a 911 call. “It took the guard quite a while to get to the boy since he was swept out so far from both Stone Steps and Beacons,” Giles added. At approximately the same time the 12 year-old was getting rescued, four swimmers were rescued after getting sucked out in a rip current at Grandview. And one surfer, estimated by Giles to be a novice, was held down for a prolonged period of time and, “aspirated water and was undergoing hypothermia.” The surfer was taken off the beach by a paramedic unit and taken to Scripps Hospital. It’s a good thing the swell didn’t arrive this week. Post Labor Day, Giles’ staff dwindles down to just a few guards (two during the week and three on the weekend). Though Giles can always call on additional staff to patrol an off-season big swell, several state and city agencies don’t have that luxury. California State Park lifeguards are one of the hardest hit by the economy, according to Giles. 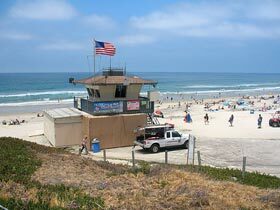 But so far, Encinitas lifeguards have been spared a downsizing. One operational rescue device that was put to good use during this monster swell was the WaveRunner. “The City [of Encinitas] takes care of us. These WaveRunners are absolutely amazing rescue tools,” said Giles. It’s one thing to get your jetski muscles in shape by taking a fun cruise on choppy three-foot surf, but with 12-15 foot sets marching towards our shores so seldom, how does a lifeguard prepare for a critical WaveRunner rescue of this magnitude? Lifeguards are required to have at least two years of experience before being considered for an Academy Personal Watercraft Operations certificate, which is a one week crash course in taking the WaveRunner out in different surf environments with fixed objects such as piers, rocks and jetties. But even the most experienced lifeguards had trouble in at least one area this past weekend: driving. With huge swells sucking sand off the beach, there wasn’t much beach for lifeguard jeeps to drive on. “Getting the Jeep from Swami’s to Moonlight Beach even on a low tide was challenging,” Giles said. As for the Great White Shark at Swami’s debate, Giles is leaning towards not a shark. Like other doubters, Giles thinks that someone would have seen the shark. Whether or not it was the backside of a Great White shark will likely be up for debate for many more Labor Days to come. In the meantime, Giles said that he isn’t marking it as an official shark sighting. Although Great Whites roam most likely not too far away from the kelp beds, Giles said he’s never seen a Great White near-shore, in Encinitas. Having been an avid spear fisherman over the last decade, though, Giles claimed he’s had a few shark encounters. Many surfers hope that the widely circulated picture of the Swami’s Shark, whether actually an apex predator or not, will at least have a profound psychological impact on some surfers, helping to thin the herd at crowded peaks. It’s not likely Encinitas breaks will get any less crowded, but what is likely is that the recent south swell and the cherry on top—the Swami’s Shark Debate—will help make Labor Day Weekend 2011 remembered for decades to come.